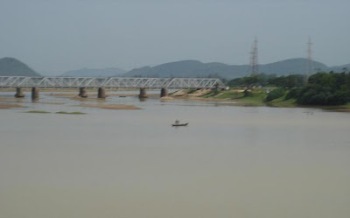 The Rushikulya is one of the major/important rivers of Odisha state and covers entire catchment area in the districts of Kandhamal and Ganjam district of Odisha. The Rushikulya originates at an elevation of about 1000 m. from Rushimala Hills near Matabarhi village of Kandhamal district which is lies within the geographical coordinates of 19.07 to 20.19 north latitude and 84.01 to 85.06 east longitude. It meets the Bay of Bengal at Puruna Bandha of Chhatrapur block. Its tributaries are the Baghua, the Dhanei, the Badanadi etc. It has no delta as such at its mouth.